In Alaska Gold, airing tomorrow night on PBS (check local listings), FRONTLINE probes the fault lines of a growing battle in Alaska’s Bristol Bay region, home to the world’s last, great sockeye salmon fishery — and mineral deposits estimated to be worth up to $500 billion. Lake Iliamna, Alaska — Rick Halford is a Manifest Destiny kind of Alaskan. He cleared his land with dynamite. He calls himself the “ideal redneck Republican.” As a longtime leader in the state legislature, he never met a hard rock mine he didn’t like. That is, until he took a long look at the proposed Pebble Mine in southwest Alaska. It’s a phenomenal prospect, the biggest and richest in North America. But to dig a mine there is to make a Faustian bargain that involves an agonizing Alaskan twist. In return for copper and gold worth an estimated half a trillion dollars, state and federal regulators risk poisoning what scientists describe as the last best place on earth for millions of wild salmon – and the risk from toxic mine waste would last forever. Global mining giant Anglo-American and its Canadian partner, Northern Dynasty, want to dig one of the world’s largest open-pit mines — up to three miles wide and thousands of feet deep. 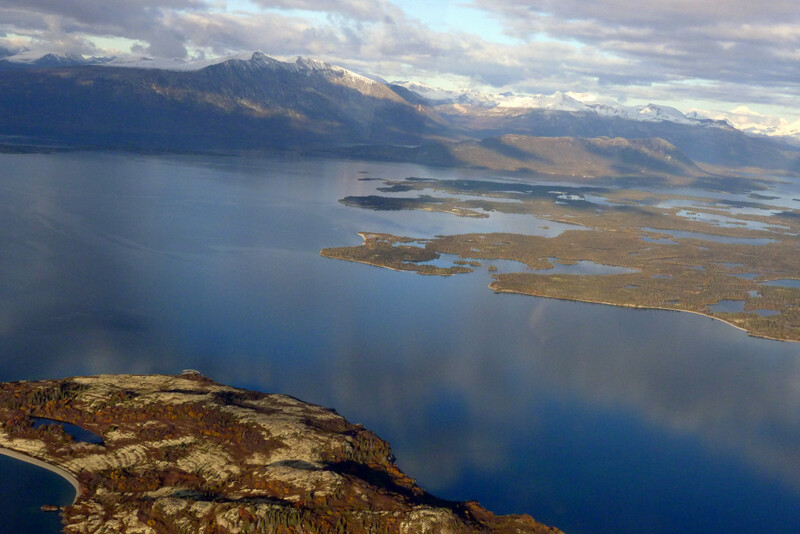 They want to do it in the near-pristine watershed of Bristol Bay, home to the world’s largest sockeye salmon fishery. No mine of this size – with huge dams for mine waste that would stand taller than the Washington Monument — has ever been developed in such an ecologically sensitive region. The proposal has triggered partisan infighting that reaches from the Alaskan tundra to the halls of Congress, where House Republicans accuse the Obama administration of plotting a preemptive move to kill the mine. In a report this year, the Environmental Protection Agency described the Bristol Bay fishery as “a significant resource of global conservation value.” The agency noted that more than 14,000 people have salmon-based jobs in the region that sustainably generate $480 million a year. The report also warned that during the lifetime of the Pebble Mine accidental spills of waste are likely to pollute some waterways, creating the potential for killing salmon and poisoning their habitat for many years. Executives at the Pebble Limited Partnership, a company owned in equal parts by Northern Dynasty and Anglo-American, say they have the know-how to operate an open-pit mine in the Bristol Bay region for a hundred years or more — without significant harm to salmon fishing. When copper and gold are exhausted, Shively said his company will have the resources and the technology to make certain that significant amounts of toxic waste never leak into surrounding wetlands, streams, rivers and lakes. Minor leaks that harm some salmon are possible but controllable, he said, adding that it would be “impossible” to destroy the salmon in Bristol Bay. Protecting salmon in perpetuity from mining waste is a corporate pledge that Native Alaskan fishermen find impossible to believe. They point out that the Pebble site occupies a soggy saddle of land between the salmon-rich Nushagak and Kivichak rivers, which flow through the heart of the most productive sockeye watershed on earth. The site is also subject to extreme weather and major earthquakes. Worry about the mine, where extensive exploration and drilling has been going on for more than a decade, echoes far beyond southwest Alaska. Major environmental groups have mobilized against it, with the backing of eminent salmon scientists and celebrities like Robert Redford. More than 50 major jewelers worldwide, including Tiffany & Co., Zales and Boucheron, have promised not to use gold that comes from Pebble. Chefs, restaurants and seafood distributors across the United States have also come out against the mine. Scientists who have studied the long-term biological consequences of hard rock mining are dumbstruck by the prospect of an open-pit mine in an ecosystem where each summer 30 to 40 million salmon return from the Pacific – and where commercial and sport fishermen catch half of them without reducing the historic abundance of fish. “It is essentially a goose laying golden eggs,” said Tom Quinn, a University of Washington fish biologist who has studied and camped in the watershed for 25 years. Elsewhere in North America and across the world, when major mining development has occurred in proximity to a salmon or trout watershed, there has been a consistent pattern of pollution that erodes the health of fish or kills them outright, according to Quinn and many other researchers. Even the best mining technology, engineers and ecologists say, periodically fails to prevent spills and leaks. After mines foul streams and rivers, cleaning up the mess and reviving salmon runs have proven to be costly, complicated and slow. Fish biologists say that the damage usually turns out to be irreversible given the persistent toxicity of the pollutants, the chronic lack of government money for remediation and the history of mining companies in ducking cleanup obligations. “There really is no such thing as a ‘no risk’ mine,” said Nicole Vieira, a Colorado State University researcher who studies the effects of mining on rivers in the Rocky Mountain West. The federal government is well aware of the risks. It has been obligated by the Endangered Species Act to spend billions of dollars on salmon restoration in Western rivers. At best, taxpayer spending has helped return only a small fraction of the historic fish runs in what had once been great salmon highways. The EPA says it has the authority under the Clean Water Act to stop the Pebble Mine from being built. It is now in the process of determining whether it should use that power. The agency’s report – and the possibility that the Obama administration might stop the mine before the state permitting process formally begins – has caused angry pushback from the state of Alaska and from Republicans in Congress. Leading the charge in Washington is Rep. Darrell Issa (R-Calif.), chairman of the House Committee on Oversight. In a letter to the EPA in May, he said the agency appears to be considering “an unprecedented and legally questionable” attempt “to preemptively veto permits for the Pebble Project.” By moving to stop the mine before other state and federal agencies examine the project, Issa said the EPA is “arriving at a conclusion without all the facts.” His letter demands that the agency disclose internal documents related to its assessments of the mine and reveal names of employees who worked on the review. In response, the EPA wrote a letter to Issa saying it has not decided if it will stop the Pebble Mine but that it does have the authority to do so, if it determines that discharge from the mine would have an “unacceptable adverse effect” on a fishery. Alaska also disputes the EPA’s authority to make the assessment, with the state’s attorney general calling it “unlawfully preemptive, premature, arbitrary, and capricious.” The dispute over jurisdiction – and when EPA can weigh in on Pebble — seems certain to end up in federal court. The push to develop the Pebble Mine comes amid surging global demand for copper. Historically high metal prices have given mining conglomerates like Anglo-American plenty of capital to invest in challenging engineering projects and to fight for years or even decades in the courts. So far, the Pebble Partnership has spent about $450 million on exploratory drilling, permit preparations and public relations. If the mine moves forward into production, it expects to spend another $7 billion or more on bringing electricity to the site, as well as on the construction of a pipeline, a road and earthen dams for waste storage. The money would benefit many large and small companies across Alaska. Americans need more copper. It is a vital building block in the gadget-crazed culture and in devices that reduce consumption of fossil fuels. Hybrid cars contain nearly twice as much copper as conventional cars. Wind turbines require tons of it. So does the power grid, which is expanding rapidly to hook up wind farms, solar panels and geothermal plants. In China and across the developing world, the need for copper is growing even faster than it is in the United States. “Copper is sort of like the stealth mineral because people don’t think about it,” said Shively, the CEO at Pebble. He says there is a “total disconnect” in the environmental community between its appetite for whiz-bang, energy-saving technology and its loathing for open-pit mining. But just as demand for copper is growing, so is the world’s appetite for fish. It reached an all-time high in 2010, as each person on earth ate, on average, 37 pounds of fish, according to the U.N. Food and Agriculture Organization. To satisfy ever more fish-eaters, industrial-scale fishing has decimated several species of wild ocean stocks. Fish farming has expanded rapidly to fill consumer demand. But in doing so, it has spread infectious diseases and compromised the genetic integrity of many species. Amid all this fish trouble, the United States has been singularly blessed with Bristol Bay, a wild salmon fishery that is as productive and healthy now as it was a century ago. Its salmon are ranked as a “Best Choice” for consumers because their flesh is delicious, untainted by pollutants and their abundance is secure in a “very robust” salmon ecosystem, according to Seafood Watch, an annual report from the Monterey Bay Aquarium that evaluates the sustainability of seafood. All five major species of Pacific salmon thrive in Bristol Bay, but the star of the show is the sockeye, whose productivity has soared in the past 30 years. Sockeye are unique among migratory salmon because they spend one or two years of their early lives in fresh water lakes. The species has not fared well in most North American waters south of Bristol Bay, in large measure because of pollution and degraded lake habitat due to development. But in the headwaters of Bristol Bay, conditions are nearly perfect. Human activity that ruins salmon habitat, such as dam building, logging, farming or road construction, is virtually non-existent. There are still hundreds of genetically distinct clusters of sockeye. Their robustness enables the species to absorb punishment from changes in weather and ocean nutrients without much fluctuation in the overall health or in the number of adult fish that return home to spawn. In ways that non-scientists often fail to appreciate, sockeye and other species of salmon are fundamental building blocks of life in southwest Alaska. Fattened by their years in the Pacific, the fish deliver about 44 million pounds of nutrients to bears, wolverines, eagles and Native Alaskans, according to the EPA assessment. Phosphorus and nitrogen from spawned-out, rotting fish are vital to plants and trees. Studies show that trees near salmon-rich streams grow up to three times faster than those near waterways without salmon. North of Bristol Bay, tens of millions of juvenile sockeye come of age each year in a vast salmon incubator called Lake Iliamna. Nearly 80 miles long and up to 22 miles wide, it is the largest undeveloped lake in the United States. It also happens to be about 15 miles downstream via Upper Talarik Creek from the proposed Pebble Mine – a geographic happenstance that mortifies fish biologists. In its assessment of open-pit mining at the site, the EPA said there is a risk that during the expected life of the mine, some contaminates – including dissolved copper — could wash into Lake Iliamna from pipeline breaks or the failure of water treatment systems. These accidents have occurred at other similar mines in the past, the EPA said. Scientists have known for a century that copper is toxic to salmon. But recent research has found strong evidence that even very low levels of copper can have disastrous effects. In Seattle, Nathaniel Scholz, a toxicologist for the Fisheries Service at the National Oceanic and Atmospheric Administration, has supervised a decade of research into the effects of copper on salmon. His research found that extremely low concentrations of copper (15 to 50 parts per billion) could damage a salmon’s sense of smell. A salmon needs to smell to avoid predators and spawn successfully. As a baby fish, it gathers olfactory memories of the streams, rivers and lakes where it was born and raised. Those memories enable it to find its way home from the ocean. “Fish that can’t smell get eaten,” Scholz said. They also get lost on their way home to spawn. If they do get back to the streams where they were born, a balky sense of smell can disrupt spawning behavior. Copper spills that are so small as to be virtually undetectable in the Bristol Bay watershed, Scholz said, could harm the salmon fishery. Even salmon with a good sense of smell would probably refuse to swim up their home rivers if copper levels are elevated, he said. Scholz’s research has alarmed lawmakers in Washington State and California, which have tried for decades to revive salmon rivers. Both states have recently passed laws to phase out the use of copper in brake pads. They want to stop microscopic traces of copper in the pads from getting into highway dust, finding its way into stormwater runoff and into the noses of salmon. Among the many pollutants unleashed by open-pit mining is copper-bearing dust, which is released in the explosions used to dig the pit. Pebble executives dismiss the threat of copper poisoning from mine dust and pipeline leaks as exaggerated and inapplicable. Pebble CEO Shively argues that simply because the mine is upstream from Lake Iliamna doesn’t mean that pollutants will contaminate it. Shively and other mine officials said that incidental, trace spillage of copper near the mine would be absorbed by organic carbon in streams and rivers — and rendered chemically harmless to salmon. Several fish scientist disputed this argument. At Pebble, separating the copper could require digging up 6.5 billion tons of dirt and rock, leaving behind mountains of waste that include sulfides and other chemicals toxic to fish. Some of it would be stored in gargantuan tailings dams (among the largest of their kind on earth). Techniques have been developed to minimize and capture leaks from these dams, reinforce them against earthquakes and keep mining waste from exposure to open air (which can turn it into sulfuric acid). Ron Cohen, an associate professor of environmental science and engineering at the Colorado School of Mines, said that while big mining companies have improved their ability to isolate mining waste, efforts to capture the waste never get it all. He said tailings dams and ore-processing facilities are most successful in terrain far from swamps, aquifers, and rivers — where the climate is consistently arid and the surrounding soil is relatively impermeable. The Pebble site, by contrast, is a vast spongy swamp crisscrossed with streams and punctuated by small lakes. Abundant ground and surface water are constantly mingling through a gravel-based soil that is highly permeable. The Pebble Partnership must build an 86-mile-long slurry pipeline to transport dissolved copper to a deep-water port. It will cut across wilderness, crossing hundreds of salmon streams and passing near the north shore of Lake Iliamna. These kinds of pipelines often leak during their lifetimes, Cohen said, echoing the EPA assessment. There are other less risky sites in the American West, South Africa and South America for large copper mines. Cohen said that these sites, while they may not be as large or as profitable as Pebble, could produce enough copper to meet global need without endangering a world-class fishery. 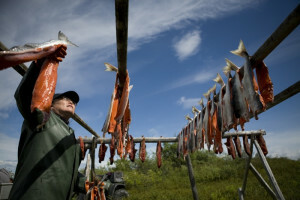 In native villages along the shores of Lake Iliamna, residents eat salmon nearly every day. Catching salmon is a seasonal ritual that binds families together, while preserving cultural identity. Salmon, though, are not enough to survive in modern Alaska. To pay bills, villagers say they need cash. The best-paying fishing jobs have always been in towns around Bristol Bay, which is about 80 miles south of Lake Iliamna but not reachable by road. Even in Bristol Bay many native Alaskans have sold their fishing permits to non-Alaskans, who now hold about two-thirds of the lucrative drift-net permits and earn most of the fishery’s cash revenue. Around Lake Iliamna, good year-round jobs were always hard to find. That is, until the discovery of Pebble. “If Pebble wasn’t here, I don’t know where I would be working,” said Sheena Ishnook, 23. She has a $17.50-an-hour job operating an incinerator in Newhalen, a village on the lake. The job is funded by the Pebble Partnership, as part of its campaign to win over local support. With her savings, Ishnook bought an iPad and is saving for a snow blower and a truck. She has heard, of course, that the mine might harm the salmon she and her family rely on for food. For several years now, Alaskans have been haggling about – and voting on — the risks and rewards of the proposed mine. 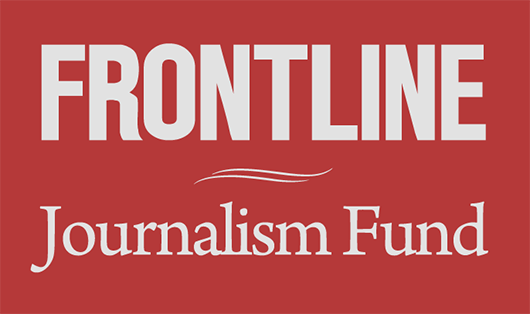 Television and radio periodically bombard them with ads, some financed by Pebble, others by environmental interests. A statewide vote in 2008 narrowly supported the mine, with the backing of then-Gov. Sarah Palin. But in the fall of 2011, residents of the sparsely populated Lake and Peninsula Borough, where the mine would be built, voted narrowly against it. The vote was 280 against, 246 for. There are only 1,631 people in the borough, which is about the size of Kentucky. The promise of high-paying jobs at Pebble – 2,000 in construction and 1,000 in mine operations — comes at a time when Alaska is searching for new tax revenue to replace dwindling income from North Slope oil. As much as any state, Alaska depends on natural resources for growth; its constitution obligates elected leaders to develop them for the good of the state’s 698,000 people. Two-thirds of economic growth since statehood, as measured by jobs and income, has come from oil. The state Permanent Fund, which last year paid every Alaskan $1,174, also depends on oil. Yet under existing law, the state’s tax take from Pebble is likely to be negligible for many years. It “is difficult to see where the actual value of the ore extracted is exposed to any substantial type of taxation by or payment made to the State,” according to a 2007 memorandum written by an assistant assessor in the state Department of Commerce. It notes that the law’s “intent appears to have been to attract large-scale mining,” not to tax it. State officials declined a request to comment on the memorandum. So far, the state has also declined to estimate how much tax revenue would come from Pebble’s estimated deposits of 80 billion pounds of copper and 100 million ounces of gold. If the Pebble Mine begins operation, Tangeman said the state would probably move to increase mineral taxes, which he described as archaic. Pebble CEO Shively also acknowledged that taxes in Alaska are low by international standards and said his company would support raising them. The Republican-controlled legislature, however, has repeatedly killed proposals to increase taxes on mining. Complementing its tax laws, Alaska has some of the world’s most industry-friendly regulations for issuing mining permits. That’s the conclusion of the Canada-based Fraser Institute, a think tank that surveys attitudes of major mining companies. In 2010, they ranked Alaska second (behind the Democratic Republic of Congo) among 72 global jurisdictions in creating a regulatory framework that encourages mining investment. Rick Halford wrote some of these regulations back in the 1980s, when he was a Republican leader in the state Senate. They require mining companies to pay salaries and overhead costs at the Alaska Department of Natural Resources when state employees process mine permits. Under these rules, no major mine has been turned down by the state. The regulations have saved money and encouraged small- and medium-sized mine operations, Halford says. But he now believes the rules undermine the state’s ability to evaluate a multi-billion-dollar project like Pebble. Like many conservative Alaskans, Halford hates it when the federal government, particularly the EPA, intrudes in state business. Still, as much as he would like to see more mining, more high-paying jobs and more economic activity in Alaska, the scope of Pebble – and its forever risk – have convinced him that any decision about the mine’s future should be made at the national level. “The real hope of stopping this development is the national conscience,” he said. *Update (July 25, 2012):This post has been updated to reflect Rick Halford’s affiliation with groups opposed to the mine.